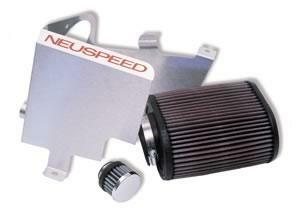 NEUSPEED P-Flo Intake - Dezod Motorsports Inc - Home of the automotive performance enthusiast since 2002. The NEUSPEED P-Flo – Often imitated…NEVER duplicated! The P-Flo was another first from NEUSPEED! You get increased throttle response, better fuel economy, and more power when you install our P-Flo kit. Others have tried to emulate our work, but no one has been able to match our unique combination of performance, quality, and durability. By eliminating the restrictive factory air box, a greater efficiency is achieved to produce an honest 5 – 8 more horsepower, depending on the application. Every P-Flo kit includes a high-performance air filter that is washable and reusable. You also get an aggressive, deep, throaty engine sound. P-Flo kit features a brushed stainless steel cold air box for a cooler air charge for maximum power and great looks under the hood. Our “Classic” P-Flo kit for the Corrado, Golf II, Jetta II, and Passat feature custom made brackets with our trademark gloss black powder coated finish. All kits include all necessary hardware, as well as, clear and detailed installation instructions. VW P-Flo kits are 50-state legal thru 1995. Audi and VW P-Flo applications 1996-02 are 50-state legal when combined with a P-Chip, also known as the NEUSPEED Power Pack.